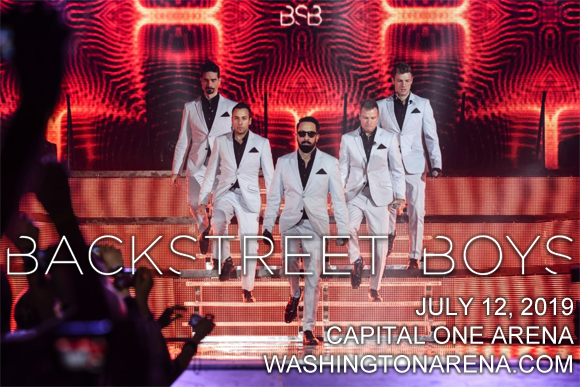 To the joy of thousands of fans across North America, 90s teen heartthrobs and pop icons the Backstreet Boys are headed to Capital One Arena on Friday 12th July 2019 in support of their brand new album, DNA! Performing as part of their biggest tour in 18 years, the beloved five-piece will not only be performing fresh new material, but also a huge selection of renowned smash hits from throughout their 25 year career! Formed of AJ McLean, Howie Dorough, Nick Carter, Kevin Richardson, and Brian Littrell, the Backstreet Boys are the best-selling boy band of all time, and one of the world's best-selling music artists, having sold over 100 million records worldwide. The first musical act since Sade to have their first nine albums reach the top 10 on the Billboard 200, the group rose to fame in 1996 with their self-titled international debut album. The group took a two year hiatus in 2003, and returned in 2005 with Never Gone. The following year, after the Never Gone Tour, Richardson left the band to pursue other interests, but returned in 2012 and has been a permanent member ever since. The group celebrated its 20th anniversary in 2013, releasing its first independent album, In a World Like This, which debuted in the top five. That same year, the group received a star on the Hollywood Walk of Fame. The Backstreet Boys released their first documentary movie, titled Backstreet Boys: Show 'Em What You're Made Of, in 2015. DNA, their tenth studio album, was released in 2018.